documentary style pieces to share stories unheard. 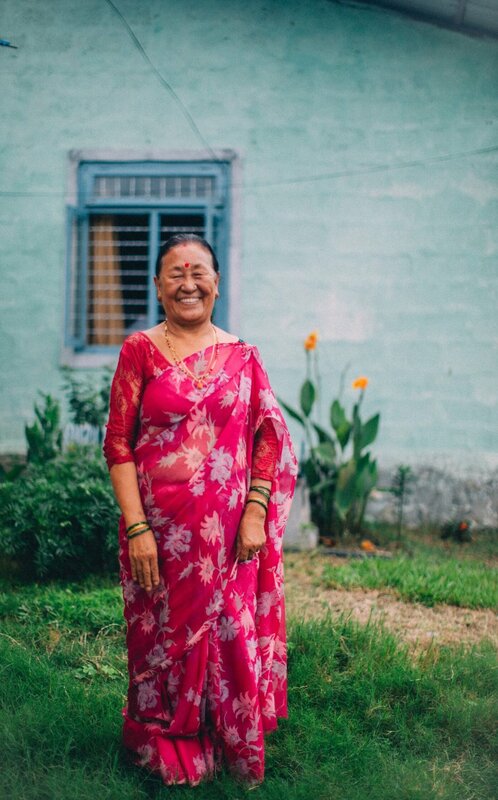 If you are interested in supporting WSDO and have a small shop you can partner with them to carry some of their product or purchase individually online at www.wsdonepal.com or www.wovennepal.com. A nun teaches a secondary school class in rural India outside of Bangalore. This school is an English medium school - boys and girls attend classes together which is promoting girls to stick to the education system. As I watched the classes in session I was seeing a group of strong young women working hard to get to the next step on the education ladder. It is such an amazing time to be in India, where change is coming and women are starting to gain respect and value. Less than half of the population of children from 6-14 in India actually can or will attend school. Education is so important in the progress of eradicating poverty, and change is coming. P1: A woman from WSDO works as a cotton dyer, which will later be turned into bags and clothing to support her and 599 other women. Each woman has a specific skill and job that she can finesse and hone over the years in order to become an expert in that field allowing them an opportunity to create a source of income for them and their families. Most women at Woven and WSDO are widowed, disabled or face poverty lines that seem uncrossable. This environment allows them a safe place to work with fair trade wages and conditions. P1: A woman walks with her family for the Gai Jatra festival - a celebration in Nepal of the lives that had passed on the year before. The families dress their youngest son up as a cow (if a real cow isn't available) and parade through the streets with full bands and large photos of their late loved ones on sticks. P2: Three women sit in front of their homes watching the festival pass by they welcomed me with open arms and asked me to stay a while - their warm nature and smiles are what every traveller needs when walking unfamiliar streets. P3: Women lounge in front of the local news stand whispering and laughing with each other as people danced around them strolling cows and signs throughout the city. P4: The oldest son in the family is dressed up as a "cow" to honor his family members who had passed the year before. 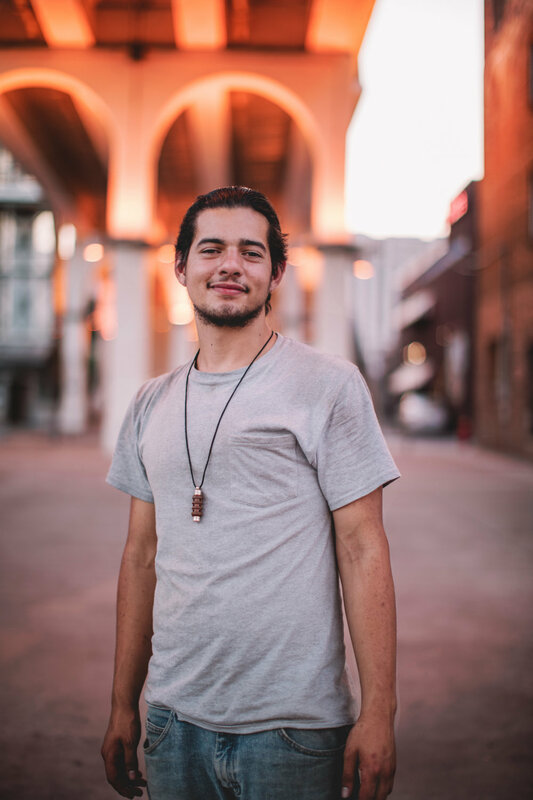 Sam Son was a bright soul with an even brighter smile. I caught myself laughing just because he was, even though he spoke no words and there was really nothing particularly funny happening. We were sitting in his tuk tuk surrounded by blossoming yellow trees and traditional Khmer music flowing it's way through the streets of Angkor Wat. It was Khmer New Year, a national holiday where everyone drops everything to go home and do life with each other - to dance, sing, play games, and throw baby powder everywhere. As we sat in silence he looked at me and I asked in hopes to have a simple interaction 'where are you from?'. He responded with words that drove a pain through my heart, 'I grew up near the border of Vietnam - I lived in the killing fields.' I immediately had tears well up in my eyes as I asked him if he would tell me about it. We talked for what seemed like hours on how he was taught in a school there while his mother, father and grandmother were worked to the bone in the fields. They were given very little to eat and there was 'no room for fun or parties, just work'. From the ages of 8-12 he endured some of the most horrific experiences one can have in life as people were mercilessly tortured and killed, yet somehow he keeps pressing on and has kept the kindest soul I have yet to meet. He lost his father to the killing fields, but he has started a life of his own at the age of 45 - allowing his 15 year old daughter to go to international school in order to learn multiple languages. He is learning from her now and things are starting to come full circle. I am beyond thankful for that 20 minute bathroom break and the three days, two beers, and one dinner we got to spend together. He was a light in what has been a recently dark part of my time in Phnom Penh. I learned a lot on how to turn a bad thing into good and make the best of a situation from him. He put me back on track with understanding why I am here and the purpose I serve. I dream to one day to be half of the light that Sam Son is. • If you aren't sure what the Killing Fields are there are so many resources online to inform yourself on genocide, how it starts and what we can do to prevent it. I have always had a passion for Human Rights & Social Justice Issues and have had dreams of using those passions and my talents to tell stories. I would love to change the world and eradicate all of the things that embody darkness, but today I will tell the stories of those whom inspire me in their own elements and also those who I think need to be heard to bring about new light. 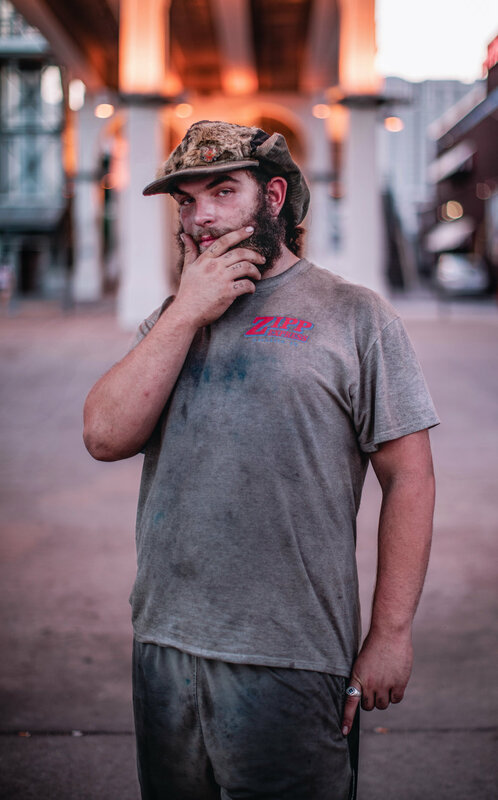 A few weeks ago a friend Tara and I got to talking with two guys under the bridge downtown - they call themselves Travelers - otherwise known as gypsies. This is Flag. 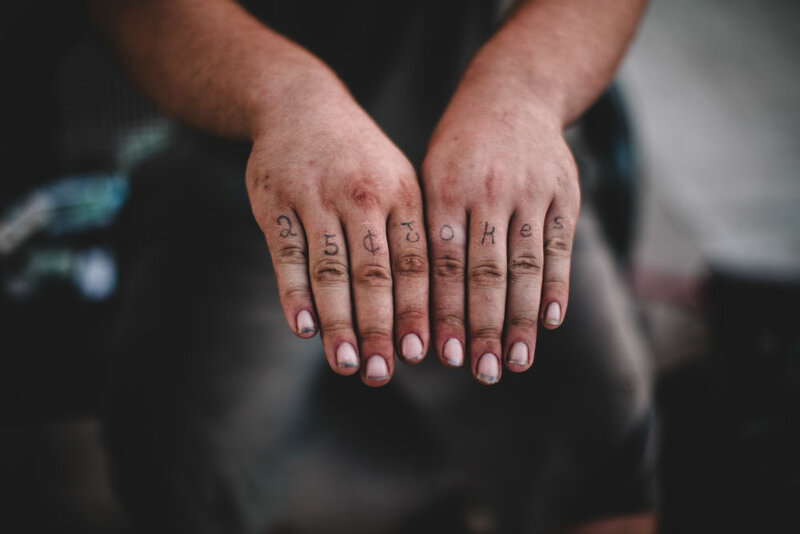 He has the phrase 25ç jokes tattooed onto his fingers and has resown the same hat 6 different times so that he doesn’t have to get a new one. He stands on the corner of crowded streets with dirt under his nails and three dogs and tells a joke to anyone who gives him a quarter (or trades a joke with him). Sometimes things go in his favor and he will get a $20 bill from a nice drunk guy on a Saturday night and rack up about $300. After a long nights work of stand up comedy - some of which is rather vulgar - he heads on up to the Hermitage Cafe to exchange his coins for dollars. Well at least this is what he had been doing for the past five days when I met him on his journey. He had a sweet soul deep down - like the story of his most recent puppy adoption - found in a Walmart parking lot with worms and ticks. So he took it under his wing, fed it some tobacco to kill the worms and now they are happily roaming the world. He asked me, do you know how many times I have made it from the east coast to the west coast in a week? And I said, “did you do that?” he said “twice”. I liked talking to him. He showed me that life can be fun, fruitful and interesting no matter what the circumstances. Find joy in this season, even when things get too hard or feel dry. Sometimes I think I would like to pack my backpack and start hitch hiking with three dogs - and then I realize its not for me - but I am glad it is for someone else. It’s nice to admire that determination and free spirit. “That will be $150” said the man behind the counter. After a little arguing, I reluctantly pulled out my cash and felt the reality of communism dig deep in to my pocket. I paid my dues and slumped my way to the security line, luckily to be compensated later by the company who sponsored our entry into Cuba. I began to weave my way through mountains of televisions, bubble wrapped suitcases, and people wearing multiple hats on their heads just waiting in line to return home. On a flight of mostly locals, there were hundreds of people trying to bring back goods that they don't have easy access too in Cuba. This was the beginning of a week long process to document and relay the stories of the Cuban people. As I tried to stay unbiased, the harsh truth of the circumstances that press on the backs of the people of Cuba became more apparent as the days progressed. Now, I want to be clear before I get into what I saw because many people have flawless experiences here - Cuba is a beautiful place full of even more beautiful people. The country itself holds so much life and zest that it made me want to move there immediately, and I miss it almost every day. We heard varying opinions on the reality of Cuba, but the more time spent with the same person the more truths were revealed. It is fairly easy to go to Cuba for a week, stay in government run homes or hotels, and fall into the very endearing trap that is a Communists creation of a country, but the more you dig deep and branch out from the beautifully broken city of Havana filled with colorful taxi’s and buildings, into more ‘local’ cities that can often be overlooked - the reality is shown in a more clear light. San Cristobal and Matanzas were two small cities I visited and everyone there seemed to be pretty content. Horse drawn buggies roamed the streets and tractors made out of the parts of 30 different cars chugged along the road. Chickens were clucking around every corner and old women sat in rocking chairs on front porches watching little bits of life happen in front of them while the younger generation stole gum from my backpack and hung clothes out on the line to dry. We hitched a ride with a company called Living Waters to these towns in order to check the water quality in the wells. In spite of life carrying on, although there were a few tiffs over food rations I witnessed, there was a mass deprivation of food supply as well as cholera living in the drinking water provided by the government. 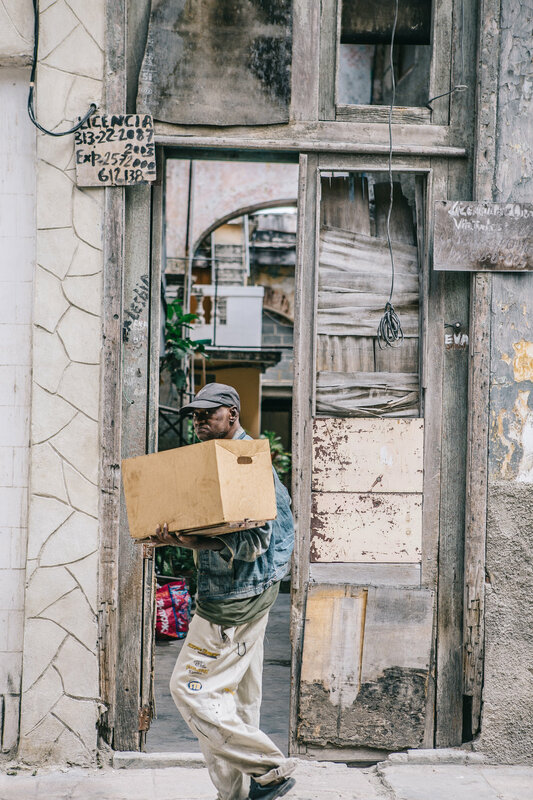 These towns were filled with hard workers who would travel up to 6 hours a day to get into Havana to make money. After a day spent in the tourism industry in Havana or Varadero they would head back out to their small towns only to have hopefully made enough money to get food for their families for the night because the rations may not have been enough. In these moments I was able to meet and interview people whom I felt deeply connected with and am lucky to now call friends. Through this process I began to understand what a standard salary looks like in the average Cubans life. The lowest salary I heard was $12 a month working at the Cigar Factory and the highest I heard was $150 a month working as a Photographer at a private night club that was frequented by mostly tourists and foreign artists. That photographer was also our fixer and his name was Damien. One day at lunch I asked him how he got his camera, being a photographer as well I figured I would ask. He told me he saved up for years for a Canon Mark III - which run around $3,000 all in - so that he could make money and create art. In order to buy that camera he would have had to work for 20 months non stop and not spend a penny of it to purchase the camera. On top of that he also didn't have access to the camera in the country so he had to send the money to a friend and get him to bring the camera in on a flight, banking on the fact it would get through security. Seeing as at the time the country didn't have internet or stores that sold those types of amenities. These are simple stories, ones that are real to the people of Cuba and not the worst ones I heard, but they are relatable enough to realize a stark difference in the way of life. It is a delicate topic - Cuba, that is. One that brings a lot of emotions from all sides of the issue. I try to choose my words wisely when speaking about a Country I do not live in or have the slightest idea of what it was like to live in during the rise of Castro. I do know that through many interviews and research there is a serious divide in what once was the Cuban people - and that seems to be the biggest loss. This photo was the start of a brainstorming session on how to sneak us into the stadium to watch Cuba play Tampa. The whole family gathered at the entryway of their house quarreling with each other over which back road to take and what roof would give us the best view. They invited us into their home and invited themselves into their neighbors. We climbed up narrow concrete staircases and bantered with policemen to try to get to the best vantage point. We had more fun roaming the streets with our mischievous friends than I ever would have actually had in the stadium. We watched the game in people's homes on cracked televisions next to Santeria shrines and half drank beer bottles. So here's to the people with kind souls who take you in and push the limit just enough to make it a memory. Also if you made it this far - there will be a short form documentary to come soon from @wilder_media on our trip to Cuba, so stay tuned!